Spaghetti hoops pasta in our classic tomato sauce. 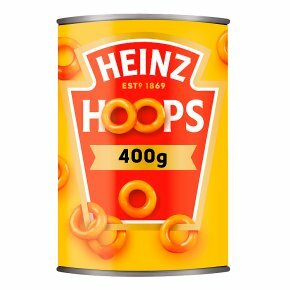 Heinz Spaghetti Hoops in tomato sauce are prepared with tasty pasta and delicious juicy tomatoes, for your whole family to enjoy. Microwave: (850W): Microwave ovens vary. The following is a guide only. Empty contents into a microwaveable container and cover. Heat on full power for 1 1/2 minutes. Stir, then heat for a further 1 minute. Check that product is hot before serving.MICROWAVE IN 2 1/2 Minutes.